Spices are an integral part of every Indian kitchen. There are a variety of them used for different dishes and we use them regularly in our food preparations. You can use them in two ways-to directly add while cooking or for seasoning/tempering. For a while now, I’ve been thinking of an easy and efficient way to organize all my spices in my limited storage kitchen. Every Indian kitchen has its own way of storing them to preserve the aroma and flavors. I generally prefer the traditional Indian spice box or ‘ masala dabba’ as we refer to it in our language.I use this to store my regular spices that go into my day-to day cooking like cumin,lentils,chillies,salt,mustard,garlic etc.I also have these small glass jars from IKEA for other spices that I use less often .This situation worked for me but it was about time I took care of the other spice boxes that I only needed for a refill. Until now they were just resting or I must say scattered on my kitchen shelf (see image 1)and it was a hassle ,every time I wanted to use any of those .I usually end up buying the same stuff over and over ,either because I don’t remember if there’s a box of it hidden somewhere behind all the clutter on my shelf or I’m too lazy to get on my step stool and look for it while I’m busy cooking . (I hope at least a few of us can relate to this situation! ). Finally when I found this storage bin at a dollar store, I jumped at it and grabbed two of them.I thought the size was perfect to hold all my occasional spices and the handle made it so convenient and easily accessible. Now all I do is just bring the box down ,if I need something and it looks so much better with all of them stored at one place .It’s a cheap fix but it totally works! 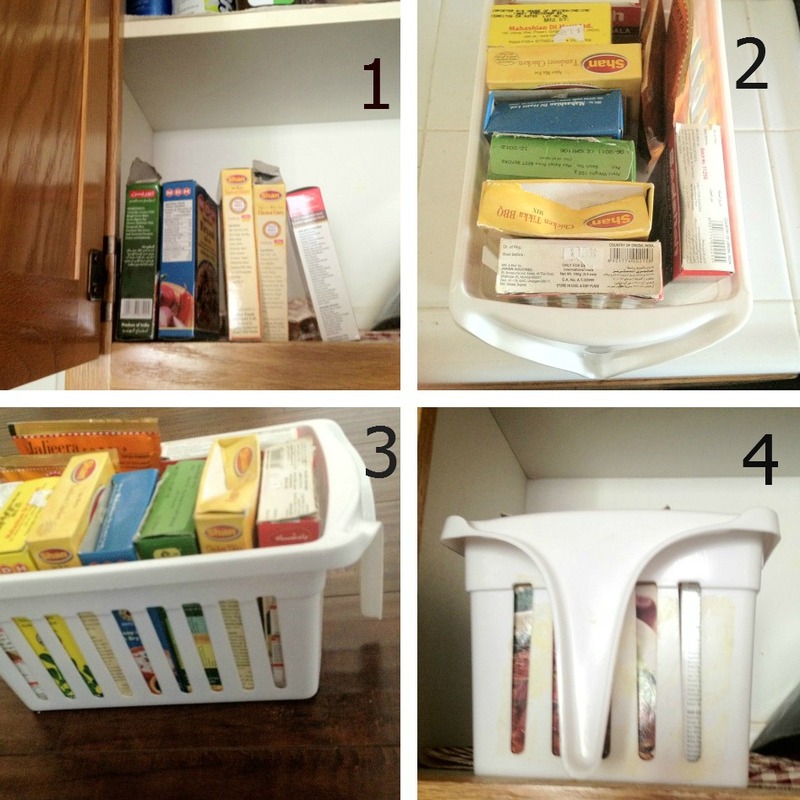 This entry was posted in Organization tips and tagged clutter free, kitchen, organization tips, organize in bins, spices.